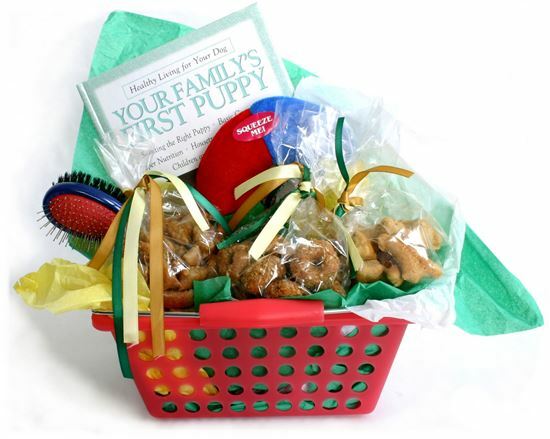 The perfect dog gift basket for that new puppy addition to your family. Your puppy gift basket includes the following gourmet dog treats:1/2 pound of our Chicken Training Treats, 1/4 pound of our Apple Oatmeal Mini Bagels , and 1/4 pound of our "Puppy Love" Beef Bones. Also included is an instructional new puppy book, grooming brush, puppy toy and personalized gift card. The healthy dog treats, book, brush, and toy, are tucked into a handle basket that will be great for storage of dog items when all the treats are gone.